Every year in May, Silhouette America holds a summit in Hawaii to announce new products and software features coming in the next year (nope, I didn’t get to go). There are some VERY exciting things coming down the pike. Here’s a preview of the upcoming products and software goodies that were announced at Silhouette Summit 2018. This has got to be THE most exciting product coming! It’s a 3D printing machine!!! How cool is that? 3D printers, if you haven’t heard of them, take a digital design and turn it into a 3D object. You create the design and then the software breaks it into “slices” (thin horizontal layers). When you send the file to the machine, it uses a plastic filament that it heats to a melting point and lays down slice by slice. Once the machine is done, you just wait for the filament to cool so that it hardens agian, and you have your 3D object. 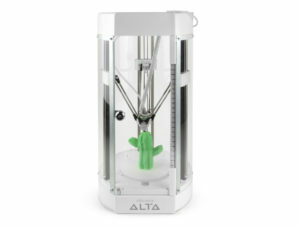 The Alta uses a new software that’s called Silhouette 3D (included with purchase). You’ll be able to “print” objects 120mm (4.72”) tall and 116mm (4.56”) wide. It works with any 1.75mm filament, but Silhouette will sell their own in 7 colors. The hot pink and black machines released last year have been such a hit that Silhouette America has added more. New this year are Aqua, Blush Pink and a Steel Gray that looks a bit lighter than the black model. They also have a “shimmery glitter.” OOH! Shiny things – love it! The Blush Pink is one of several products which are marketed in partnership with the National Breast Cancer Foundation. A portion of the proceeds from these products will go to the NBCF from September to November. I’ll make note in this post of which other products are included in this. This new blade was created to cut delicate materials more precisely. Used with the new Strong Hold mat (see below), you can even cut fabric or felt without a stabilizer or starch. That’s a gamechanger! New regular hold and light hold mats are coming. No details yet. There’s also a new Strong Hold Mat. It has an extra-tacky adhesive to hold material firmly in place. This will be very helpful for cutting fabric. This is another new fun one! Some inventive folks have already been doing silkscreening and we’ve even had a class on it at the All Things Silhouette Conferences. So Silhouette America took notice and created a kit. Use the Silkscreen Starter Kit along with the Fabric Inks to create designs on fabric. This is extremely helpful when you are making multiple projects with a single design, such as 15 t-shirts for the soccer team. The starter kit includes a frame, silkscreen sheets, heat transfer sheets, black fabric ink, and a squeegee to spread the ink around. The silkscreen sheets will also be sold separately. Have you ever seen those stickers in the store that have a plastic “dome” on top? Now you can create your own. The Doming Starter Kit includes a syringe and an epoxy solution to apply the dome on top of your sticker paper. Once it dries you have a fun puffy sticker. There are awesome vinyls in the works. Silhouette already sells metallic vinyl, but they’re adding 2 new colors: Brushed Black and Brushed Silver. Sounds so cool! 9 colors of glitter vinyl are headed our way — gold, silver, white, black, red, blue, green, lavender, and pink. This sounds super interesting. This new vinyl is colored but still transparent and has a texture on it. That will add a whole new dimension to vinyl projects. The colors are black, white, light blue, green, lavender, and pink. One of the KEYS to using vinyl successfully is to always use the correct transfer media for the type of vinyl you have. This is something many folks overlook that causes confusion and frustration. Vinyls with a texture – so the new glitter and textured translucent products – need a stronger transfer media to pick them up. The textured surface means that the whole surface of the vinyl doesn’t necessarily come in contact with the transfer media. Using a transfer tape with a stronger adhesive is the answer. That’s what the new Strong Tack Transfer Tape is all about. Oracal is, in my opinion, the industry standard for quality adhesive vinyl. It’s always reliable, comes in a multitude of colors and sizes, and stays where you put it. Oracal’s 631 is the standard craft vinyl for walls. It’s comparable to the Silhouette America matte vinyl. 651 is their designation for a more durable, permanent vinyl – one you can use outdoors. This has a stronger adhesive and is like the SA glossy vinyl. Silhouette America has partnered with Orafol, the makers of Oracal, to offer 12 colors of Oracal 651. As I said above, the correct combination of vinyl and transfer media is important. SA will also be selling Oratape, the correct transfer tape for 651. • Oracal Basics – yellow, red, lilac, azure blue, ice blue, and lime-tree green. • Oracal Essentials — white, black, gold, silver, soft pink, and mint. • Pinks – Silhouette brand vinyl with a variety of pink shades. This is another product in conjunction with the National Breast Cancer Foundation. There’s a new tool kit with all pink tools. Yep, this is one of the pink things offered in partnership with the NBCF. It has the same tools as the current set – hook, scraper, spatula, pick-me-up tool, 6” ruler and microfiber cloth. If you haven’t had enough pink yet (is that even possible? ), there are still 2 more new accessories in that luscious shade – a tote for the Cameo and a dust cover for the Portrait. Wow! So much cool stuff!!! I can’t wait to try it ALL. But wait, there’s more. Silhouette Studio version 4.2 is coming with even more features. The release is scheduled for August. I’ll be Beta testing before that (I just started playing with it today) so will be ready to share tutorials at the time of the official release. The programmers keep coming up with amazing options I never even dreamed of. Here’s an overview, including which features will be in which levels of the software. Single login from library to store – Hmmm, not yet sure what this one’s all about. Stay tuned and I’ll update this when I know. Large design preview – Oh, I’m SO happy about this one! Yep, my eyes are getting all used up so I need to see things bigger. In the Library, you’ll be able to see the thumbnail (little picture) of the design larger by hovering over it. You can also enlarge it to see it better. 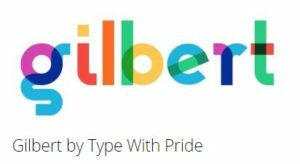 There are quite a few new fun fonts in the Silhouette Design Store lately – ones with all the bells and whistles of multiple choices for letters, extra curlicues, etc. If you are selling any product made with a font you purchase in the SDS, you need to purchase a Commercial License. This is a new way to keep them straight. Any font you purchase with a commercial license included will have a $ beside it in the font panel. Eventually, you’ll also be able to designate fonts you purchase elsewhere as commercial in your library. If you hover over the font, you’ll see details of the license (like how many items you indicated you would sell using it). Do you see the coolness? When you type a word, you get this type of result. I can’t wait until these types of fonts hit the Silhouette Design Store! This is DEFINITELY exciting! It applies only to files you create and save after installing the 4.2 update. Currently, when you save a file to your computer hard drive and then look in that folder, you just see the Silhouette logo along with the name of the file. With 4.2, you’ll get a preview of the design. A bleed is a common trick used by professional printers. If you are printing something in color and then cutting it, you set it up so that any colors at the outer edges extend beyond the cut line. That means that if the cut is off a bit, you get still get color at the edge instead of white space. 4.2 includes an option to automatically turn on a bleed for a print and cut. The cut lines don’t move. The Warp feature has been a great new addition to version 4. Now 4.2 will include some pre-loaded templates for easier usage. Currently, when you warp text it becomes an image. That means you can’t change it anymore – the words or the font – or even identify the font. With 4.2, you can. This is a feature in many other programs that some folks have been asking for in Silhouette Studio for a long time. Currently, the only option you have for selecting objects in a rectangle. Now, you’ll be able to draw a lasso around the pieces you want to select. That’s much more flexible. Overlay a puzzle over a shape. You’ll be able to change the size and shape of the pieces. So you can take any shape and make it into a puzzle. SO many creative applications here! So far we’ve been able to draw rectangles, circles and polygons (shapes with an equal number of flat sides and equal angles). With 4.2 we’ll have the option to add, resize and manipulate some basic built-in shapes such as stars, hearts, Christmas trees, etc. I’ve played with it a bit (OH it’s fun!) and it works in a similar way to the polygon creator. Create your own fonts in the software. WOW! You’ll be able to do this 2 ways. Digitally — creating the font in the software itself. Handwritten – turn your handwriting into a font. Boy! I needed this 2 years ago on a project. For those of us who teach, this is a lifesaver. It will allow us to go back and forth between different editions (levels) of the software with a mouse click. Right now, I have to turn my Business Edition license key off and on at least 10 times when writing a blog post so that I can see/play with/write about different features in each level. For folks who use their machines to make and sell products, it’s helpful to have a mock-up of designs to show customers. That’s only 1 of the reasons it’s helpful to be able to save files as raster images. Version 4.1 brought us the ability to save original designs as JPEG and PDF images. That’s been a huge help. The only problem is that JPEG images have a white background around the graphic. On PNG images, that background is transparent. For making mock-ups or doing print and cuts, the transparent background is much easier to work with. Version 4.2 will add the option to save as PNG with a transparent background. This feature helps you keep track of how much material you’ve sent to the machine by creating an Excel spreadsheet. It shows the date, the material type, and quantity used. You can then input a cost per unit (so say, $2 per foot) and see a subtotal of how much that job cost. That’s a whole ton of great stuff. Can you tell I’m just a wee bit excited? Maybe all the exclamation points gave it away. If you haven’t taken the plunge and purchased an upper level of the software, this might be the time to jump on the bandwagon. There are quite a few new features that will make it a good investment. Shop around, because you can usually find them cheaper at places other than the Silhouette America website. What new things are you excited about? Note: This post may contain affiliate links. That means if you click the link and purchase something, then I may receive a small commission. This helps me to be able to keep my business going and provide more tutorials. All opinions expressed are my own and are not tied to any compensation. Large design preview. My eye’s are old and so needed this. I know, right? I’ve been waiting for that one for a LONG time. Do you have any idea about the release date? I’m guessing you are asking about the 4.2 software update, as the products are all available other than the kraft blade. There’s no official word yet on the date for 4.2. I am still Beta testing. We were informed early on that it would be before the All Things Silhouette Conference recently, but that didn’t happen. My hope is that it will be before the end of the year, but I have no solid information right now on a date. I’ll make sure to post here on the site when I do. It was released today — 2/11/19. Any word on when the v 4.2 update will be released? There’s no official word yet as we are still in the Beta testing phase. I’ll make sure to post here on the site when it’s released. It’s now the official version as of this morning — 2/11/19. Any word on when the Kraft Blade will be released? I’m not quite sure what issues you may have been having in 4.1 or earlier. But the good news is that as of today, 4.2 is the official version and is available on the Silhouette America website. I can follow up on this now that 4.2 is released as it was earlier today. It’s still 32-bit only. The word is that the 64-bit version is the focus for the next Beta version they are working on. Mojave (the lastest Mac OSx) does still run 32-bit programs, but it is the last one that will.